After summer holiday test and enhancements we give in your hands SCS program (version 1.15) which is written to make automatic meteor-shower association. This software will help you to fill reports from your plotted observations. 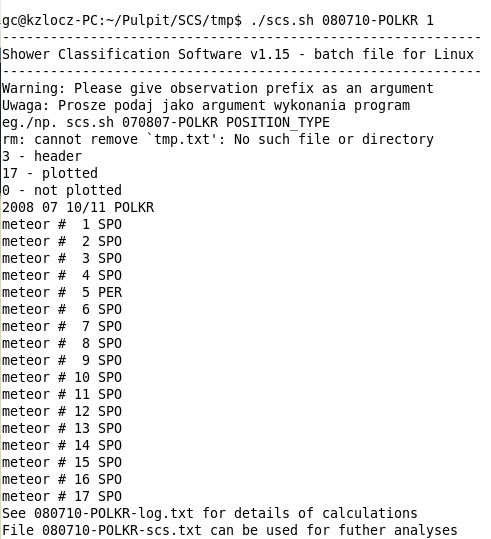 Now you can check your own calculations of meteor-radiant association procedure or use it to report plotted observation to International Meteor Organization. Program is fed with files typed using Corrida. Below you can see screenshot how SCS works under Linux OS. There is also version prepared for Windows users. We plan to publish SCS and results of test in WGN very soon. Software with instructions and auxiliary files can be downloaded here.